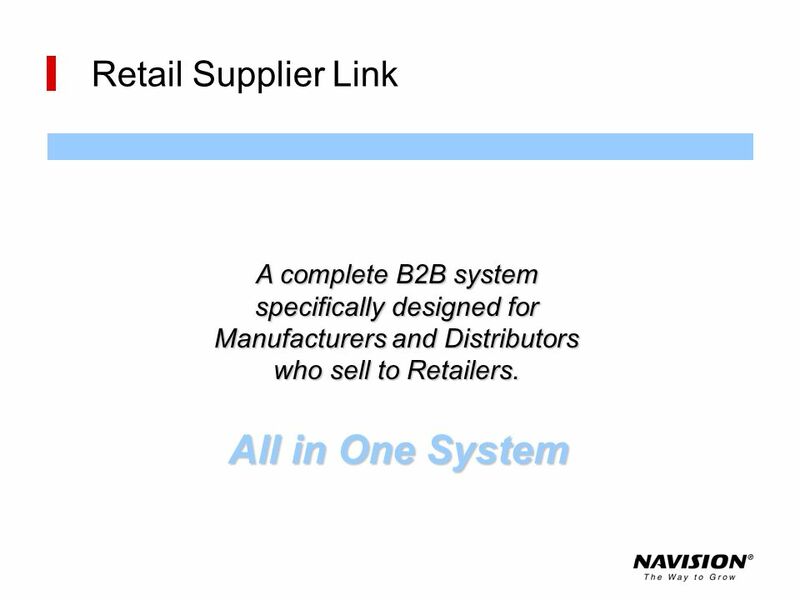 Retail Supplier Link A complete B2B system specifically designed for Manufacturers and Distributors who sell to Retailers. 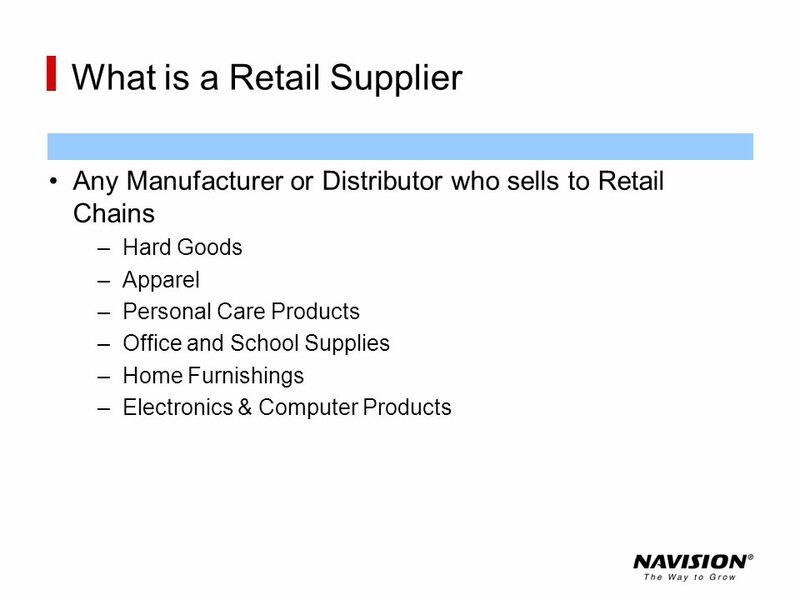 The typical Retail Supplier is smaller than the retailer. 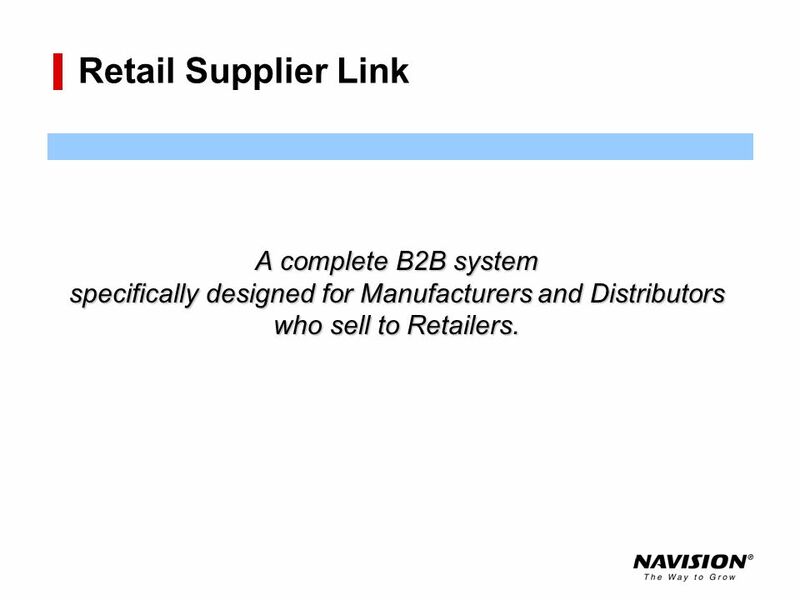 In the B2B world the large company dictates the requirements. 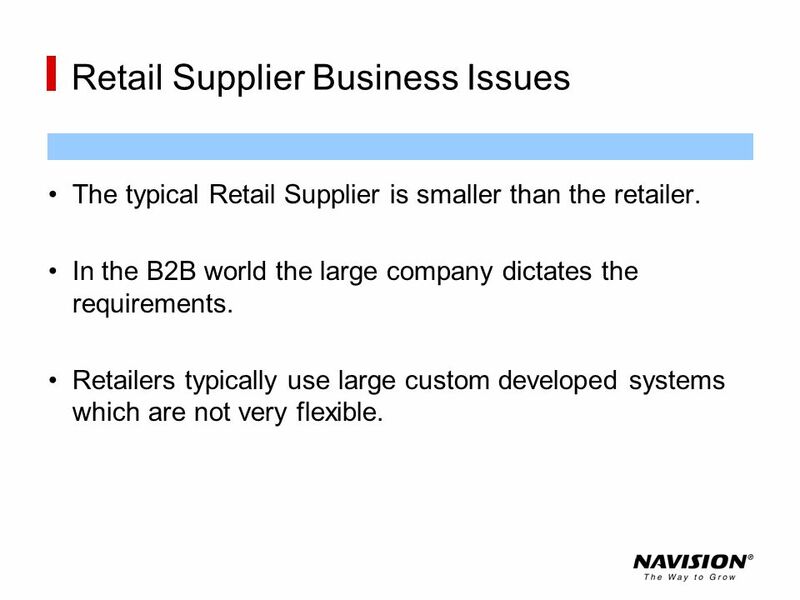 Retailers typically use large custom developed systems which are not very flexible. Deals with a large number of vendors. 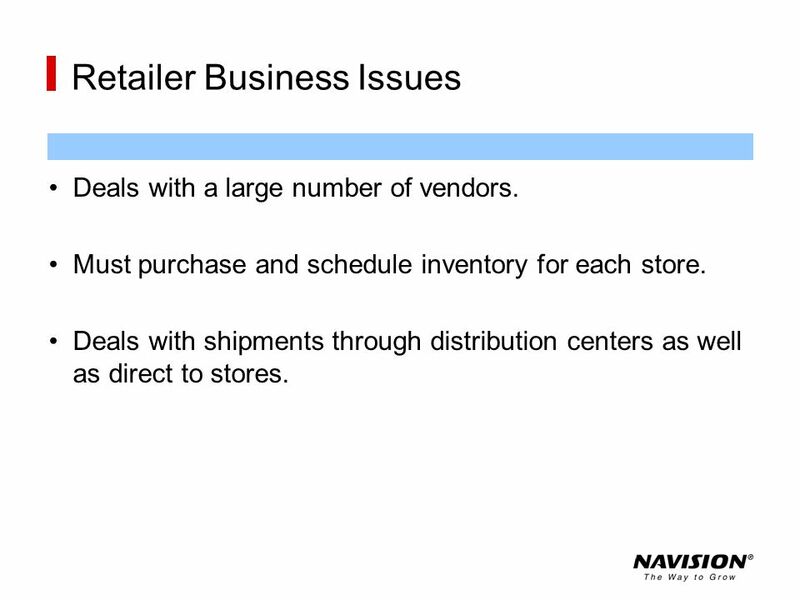 Must purchase and schedule inventory for each store. Deals with shipments through distribution centers as well as direct to stores. 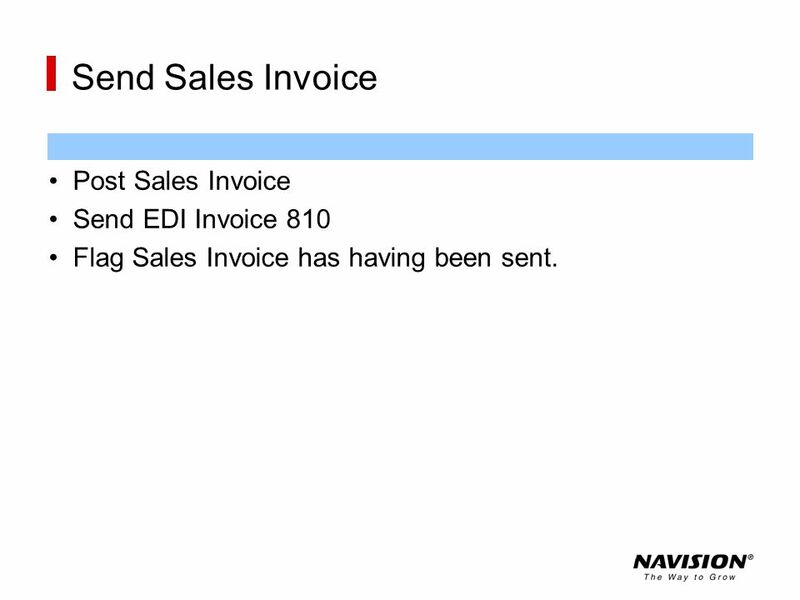 Send and receive all business transactions via EDI. Label boxes and pallets with Customer specific labels including UCC compliant barcodes. 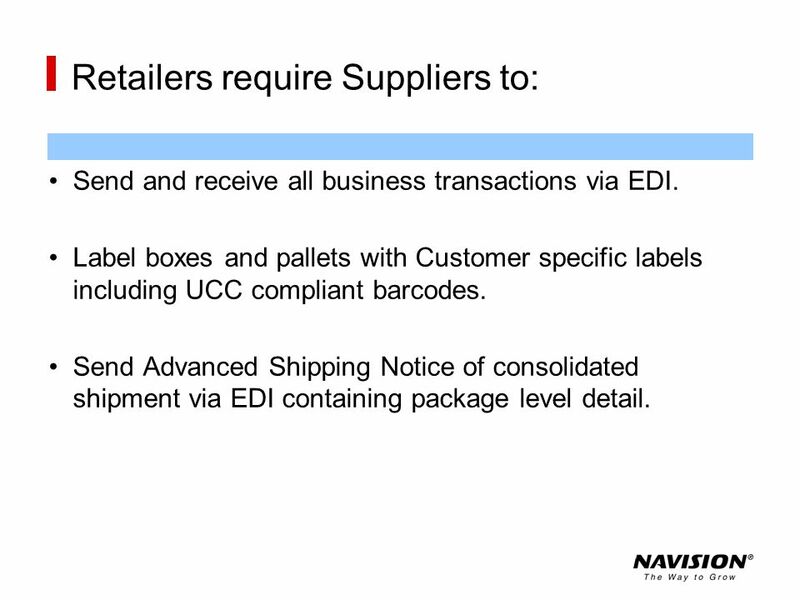 Send Advanced Shipping Notice of consolidated shipment via EDI containing package level detail. 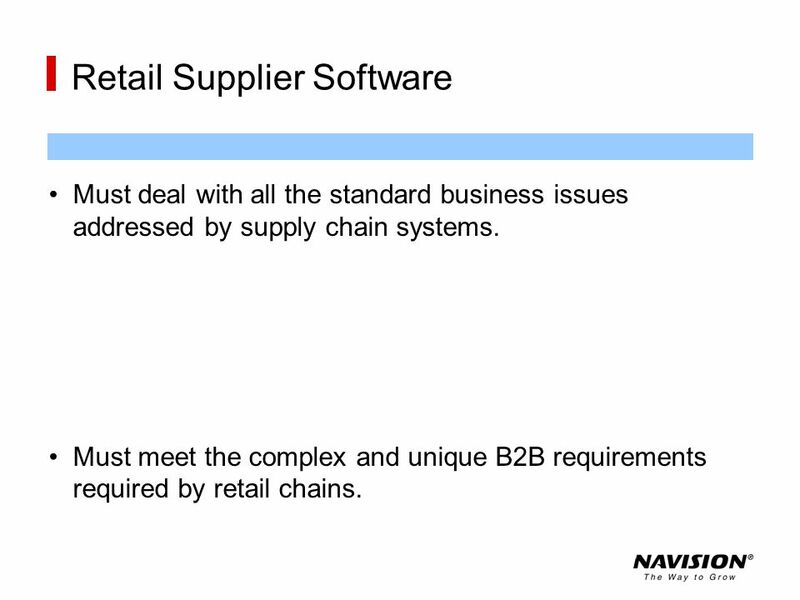 Must deal with all the standard business issues addressed by supply chain systems. 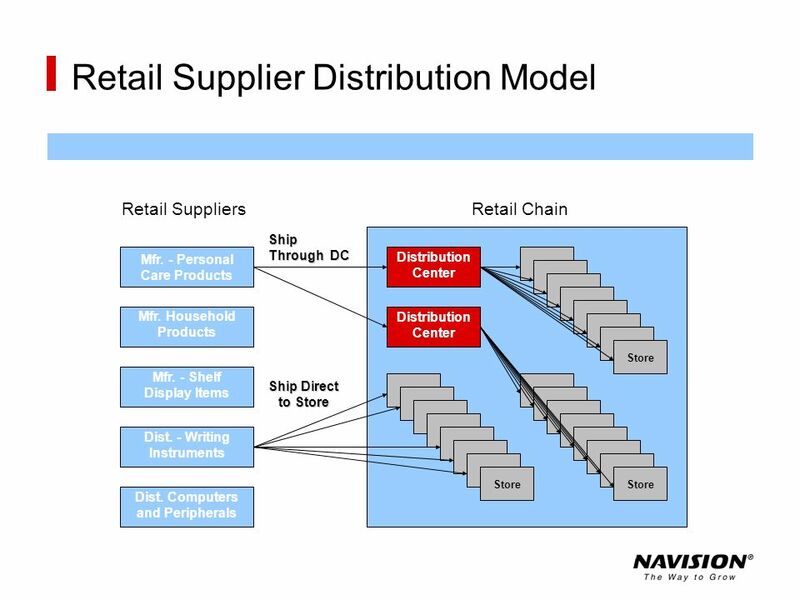 Must meet the complex and unique B2B requirements required by retail chains. 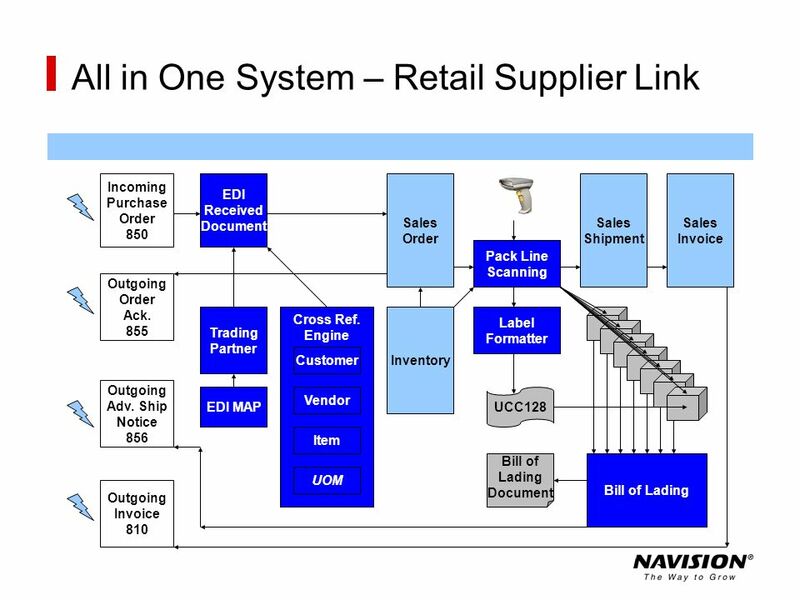 All necessary functions are contained in Retail Supplier Link Advantages Single System for planning and execution. 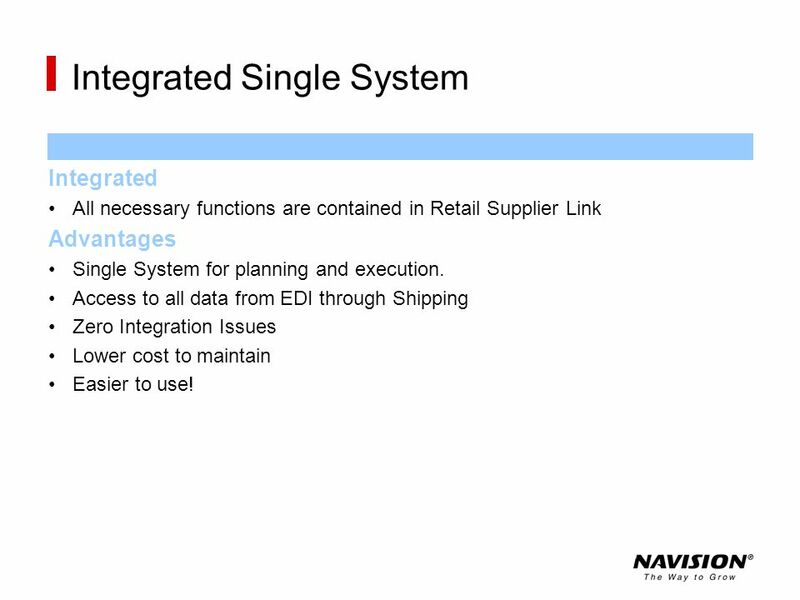 Access to all data from EDI through Shipping Zero Integration Issues Lower cost to maintain Easier to use! 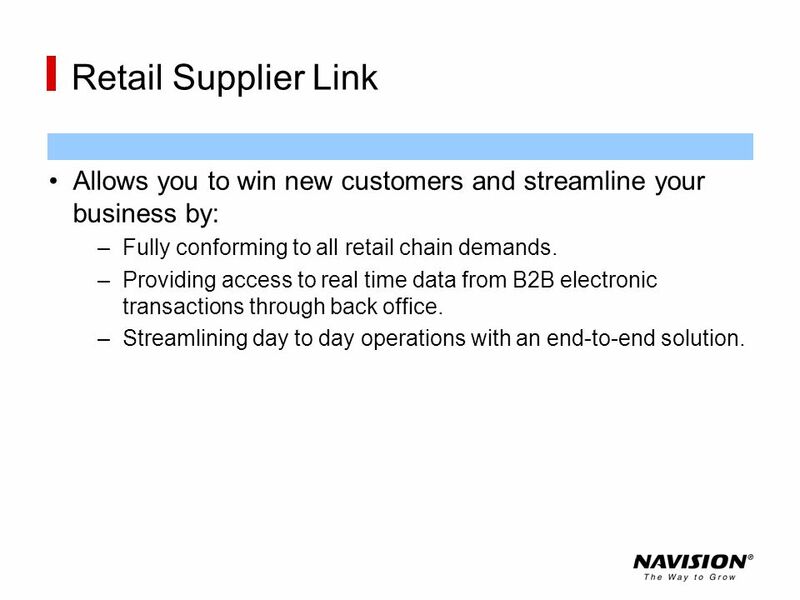 12 Retail Supplier Link Allows you to win new customers and streamline your business by: Fully conforming to all retail chain demands. Providing access to real time data from B2B electronic transactions through back office. Streamlining day to day operations with an end-to-end solution. 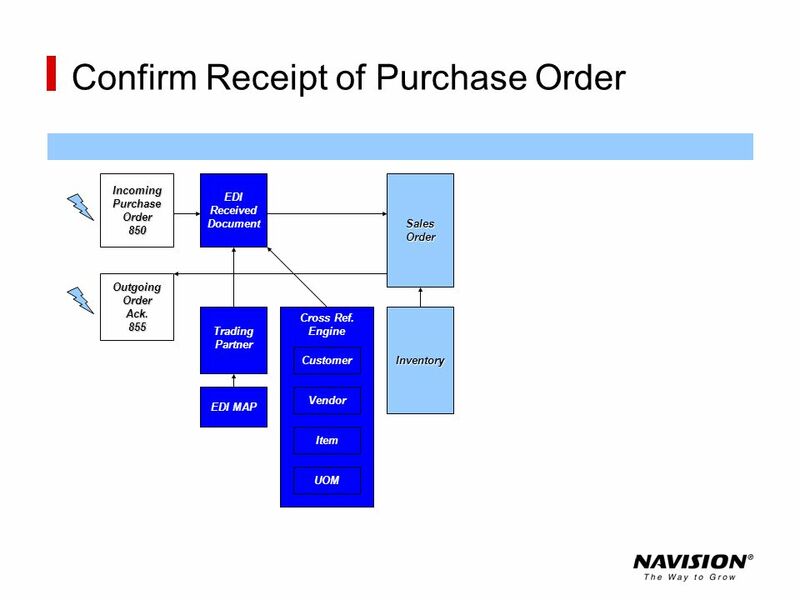 Cross reference sell-to and ship-to locations. 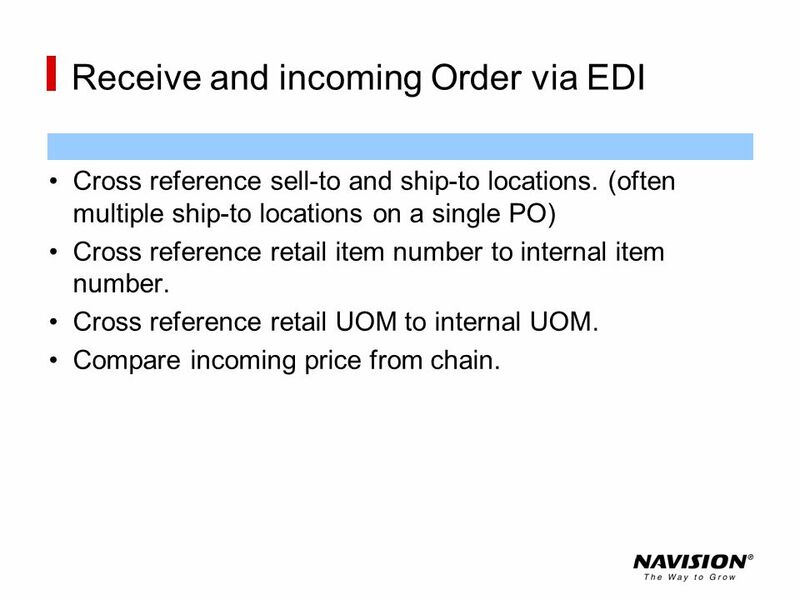 (often multiple ship-to locations on a single PO) Cross reference retail item number to internal item number. Cross reference retail UOM to internal UOM. Compare incoming price from chain. After Sales Order has been released and scheduled. 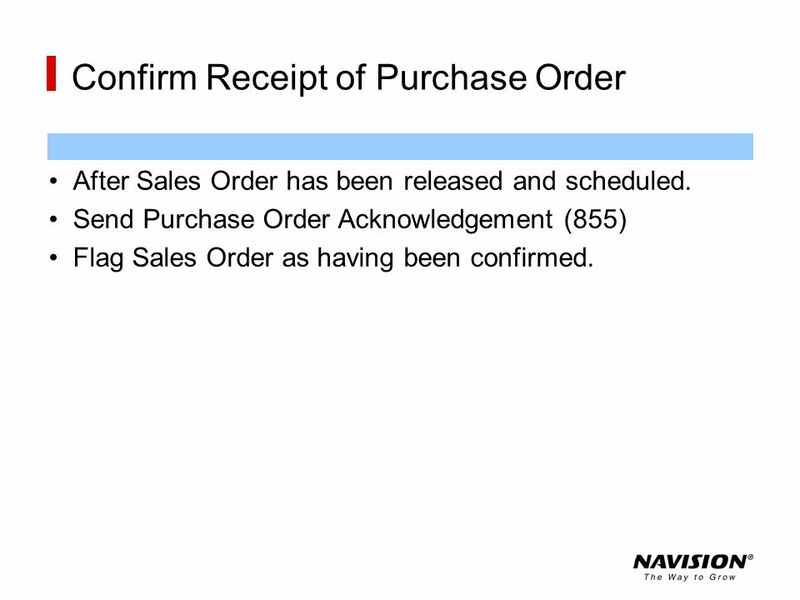 Send Purchase Order Acknowledgement (855) Flag Sales Order as having been confirmed. 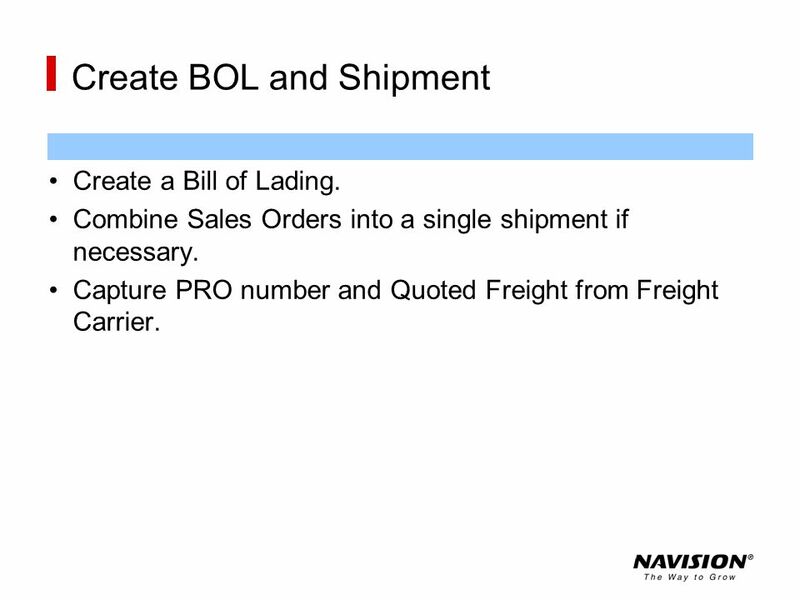 Create a Bill of Lading. Combine Sales Orders into a single shipment if necessary. Capture PRO number and Quoted Freight from Freight Carrier. Post Sales Shipment Send Advanced Ship Notice to Customer based on package level detail from packing. 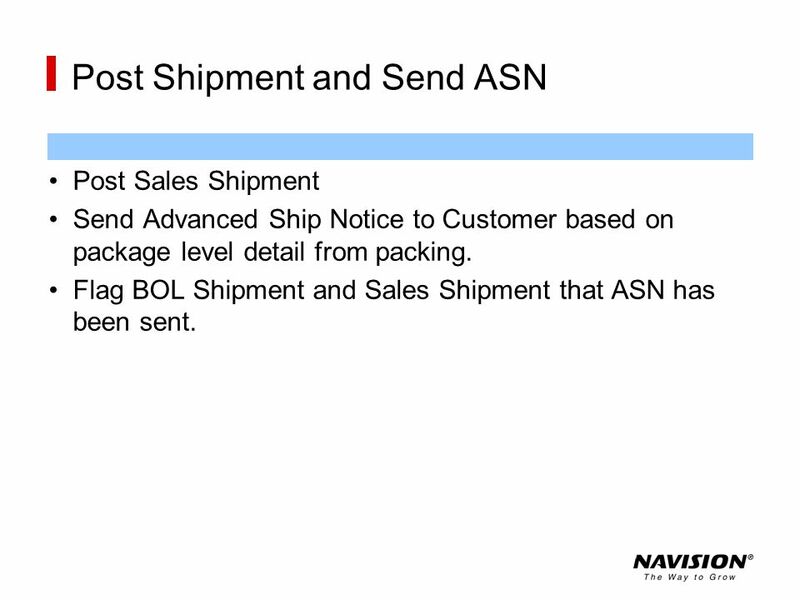 Flag BOL Shipment and Sales Shipment that ASN has been sent. Flag Sales Invoice has having been sent. 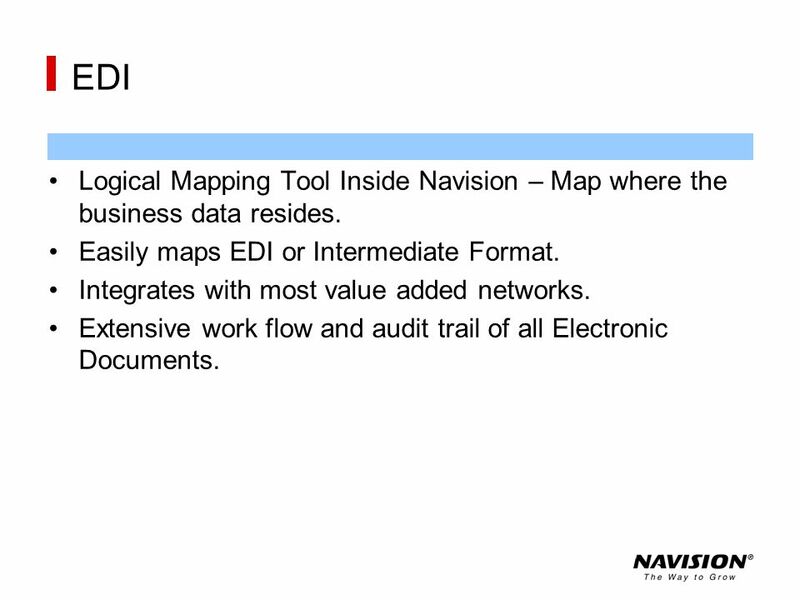 30 EDI Logical Mapping Tool Inside Navision – Map where the business data resides. 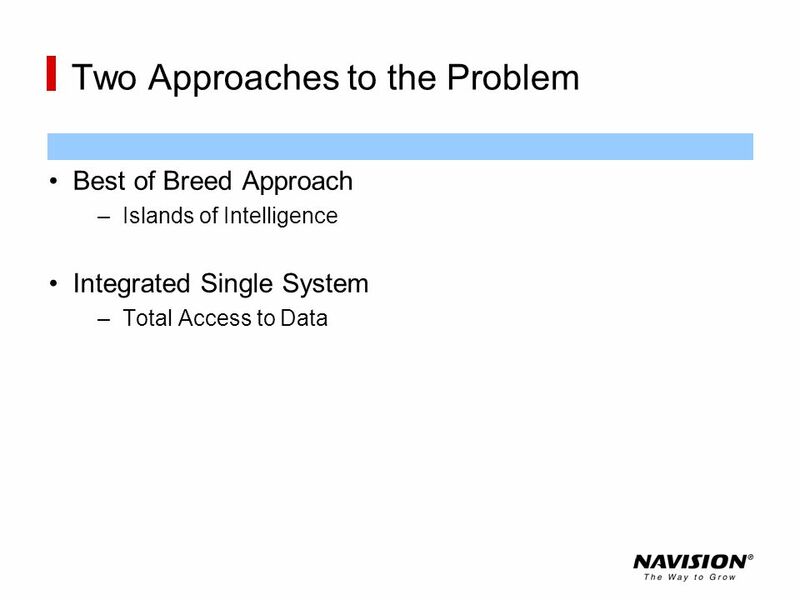 Easily maps EDI or Intermediate Format. Integrates with most value added networks. Extensive work flow and audit trail of all Electronic Documents. 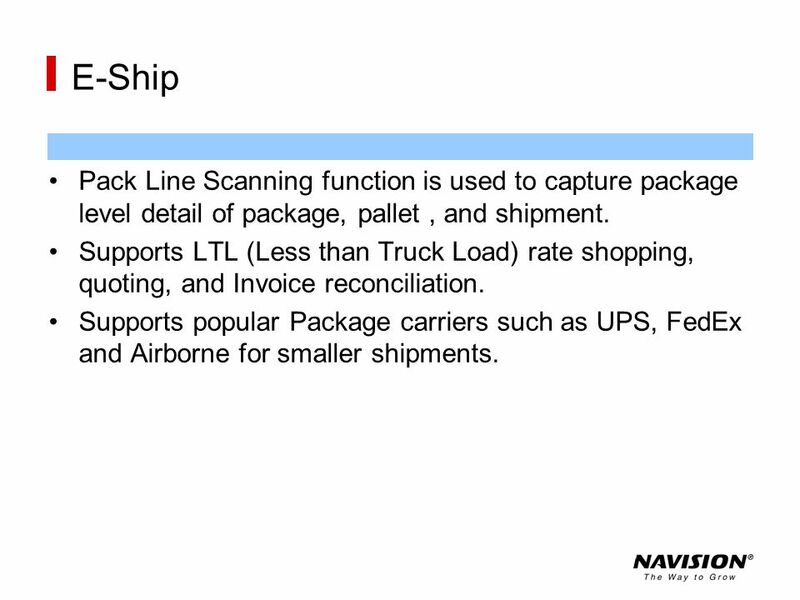 31 E-Ship Pack Line Scanning function is used to capture package level detail of package, pallet , and shipment. Supports LTL (Less than Truck Load) rate shopping, quoting, and Invoice reconciliation. Supports popular Package carriers such as UPS, FedEx and Airborne for smaller shipments. 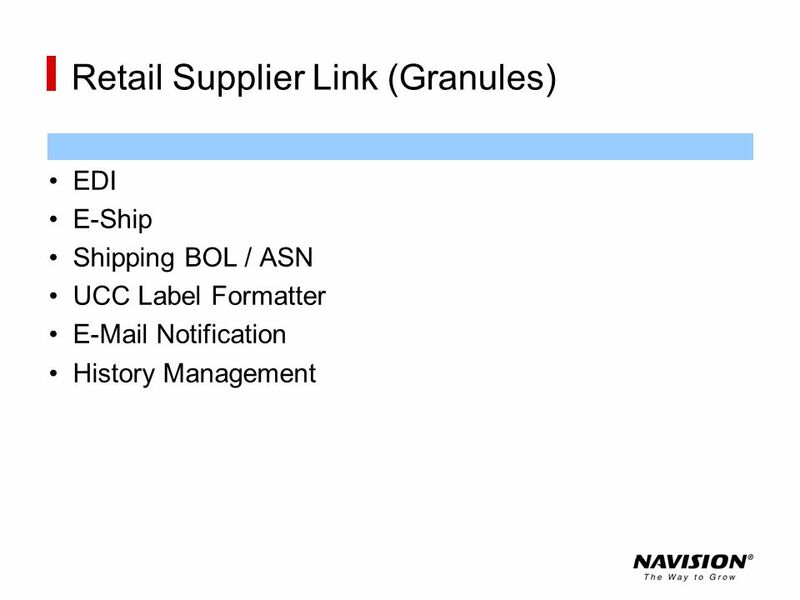 32 Shipping BOL / ASN Shipments can be planned, quoted, and scheduled before picking. 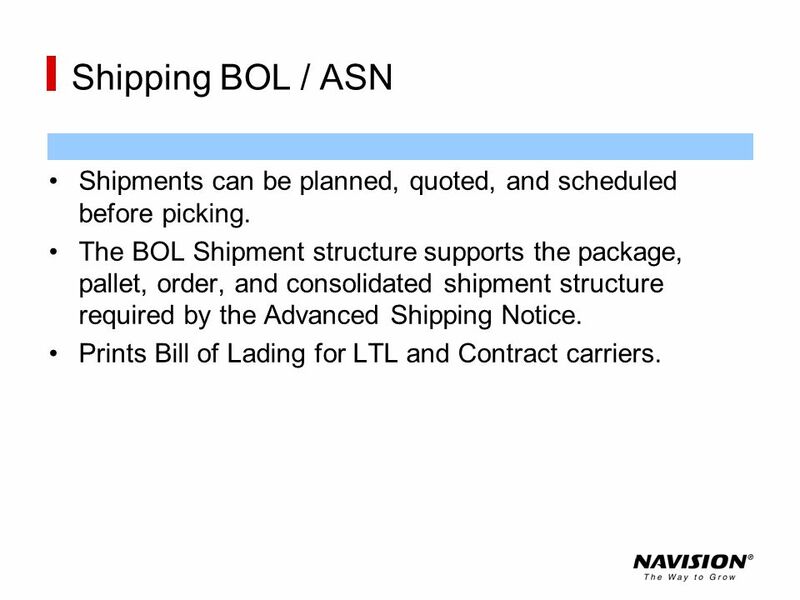 The BOL Shipment structure supports the package, pallet, order, and consolidated shipment structure required by the Advanced Shipping Notice. Prints Bill of Lading for LTL and Contract carriers. 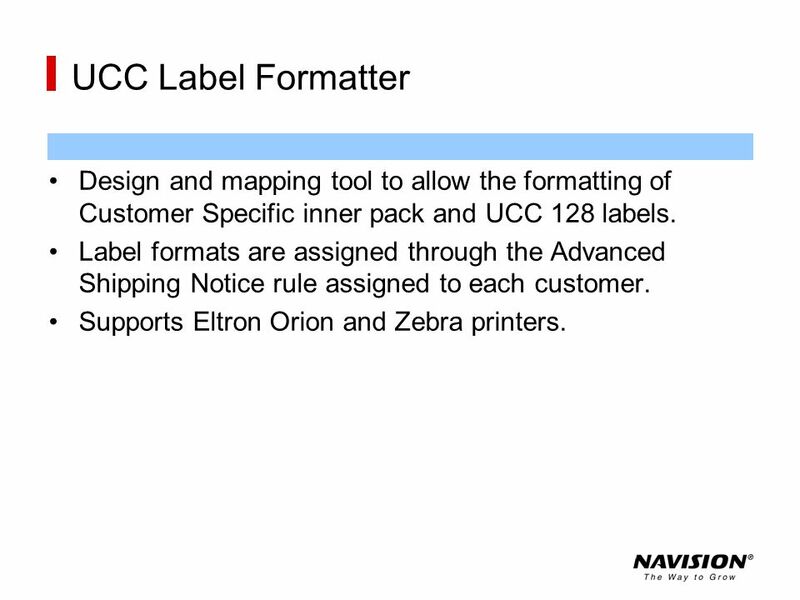 33 UCC Label Formatter Design and mapping tool to allow the formatting of Customer Specific inner pack and UCC 128 labels. Label formats are assigned through the Advanced Shipping Notice rule assigned to each customer. Supports Eltron Orion and Zebra printers. 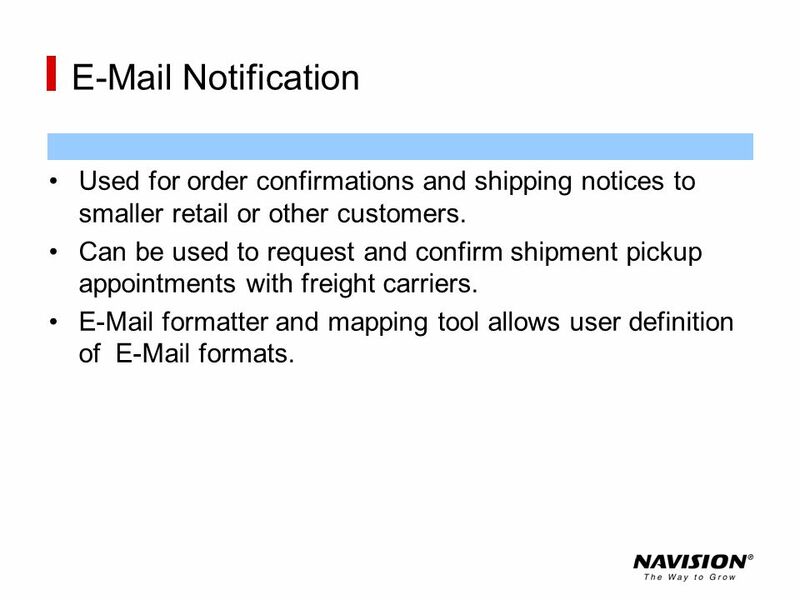 34 Notification Used for order confirmations and shipping notices to smaller retail or other customers. Can be used to request and confirm shipment pickup appointments with freight carriers. formatter and mapping tool allows user definition of formats. 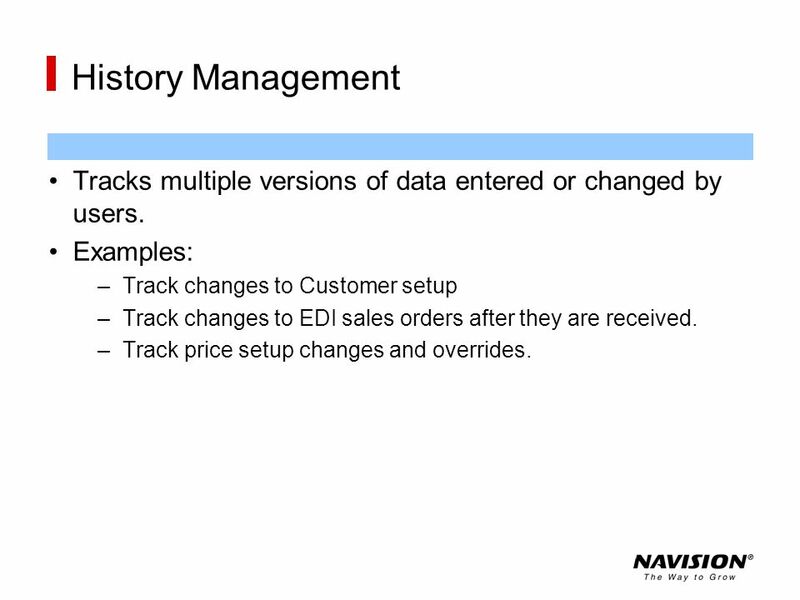 35 History Management Tracks multiple versions of data entered or changed by users. 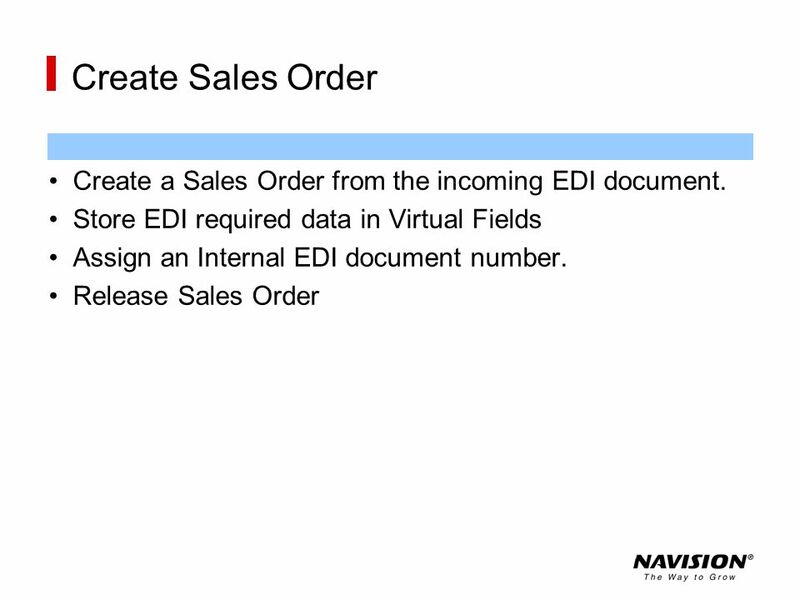 Examples: Track changes to Customer setup Track changes to EDI sales orders after they are received. Track price setup changes and overrides. 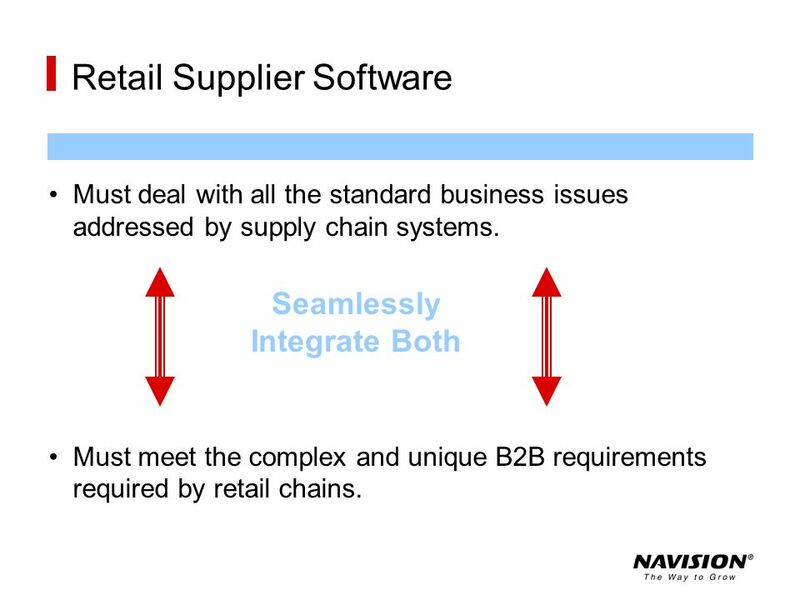 Integrates all business functions required by the Retailer into a single system. Greater visibility into all business transactions on a timely basis. 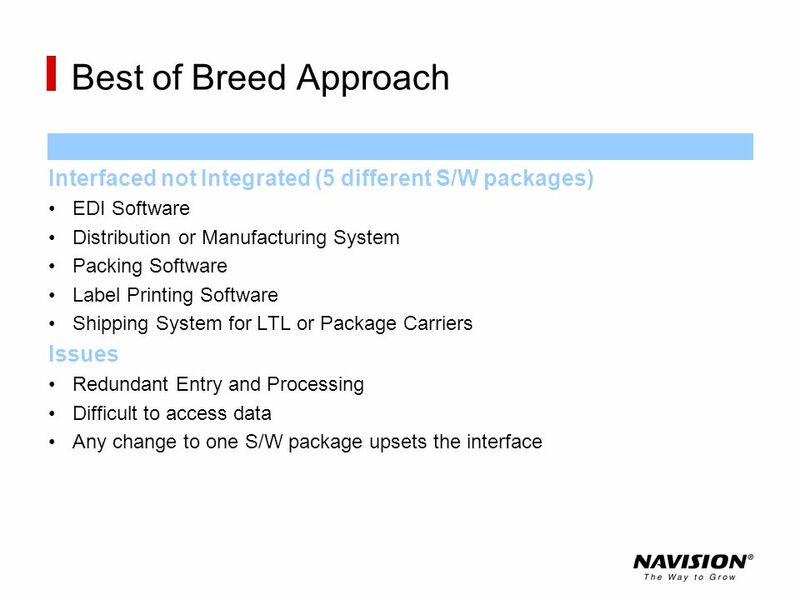 EDI, Package Detail, and Label Compliance is achieved without redundant entry or use of 3rd party software. 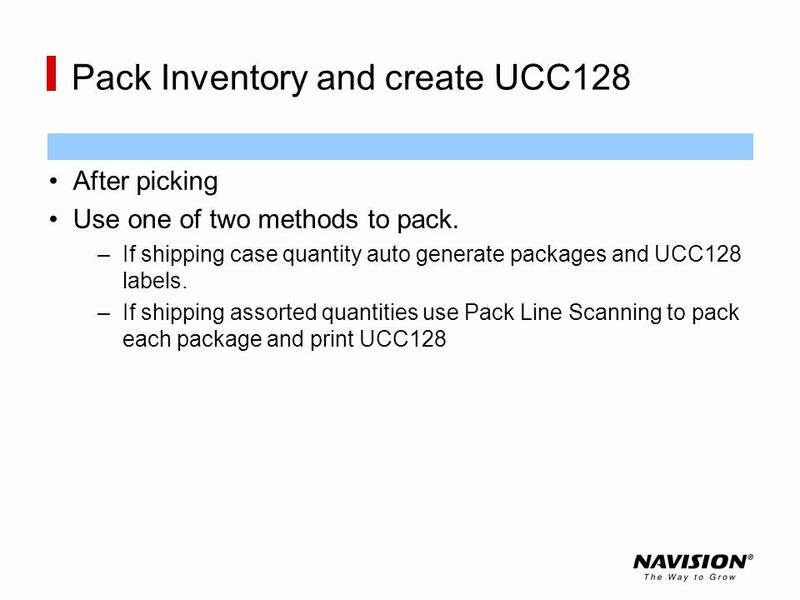 Streamline the physical pick-pack process reducing errors and minimizing redundant labor. 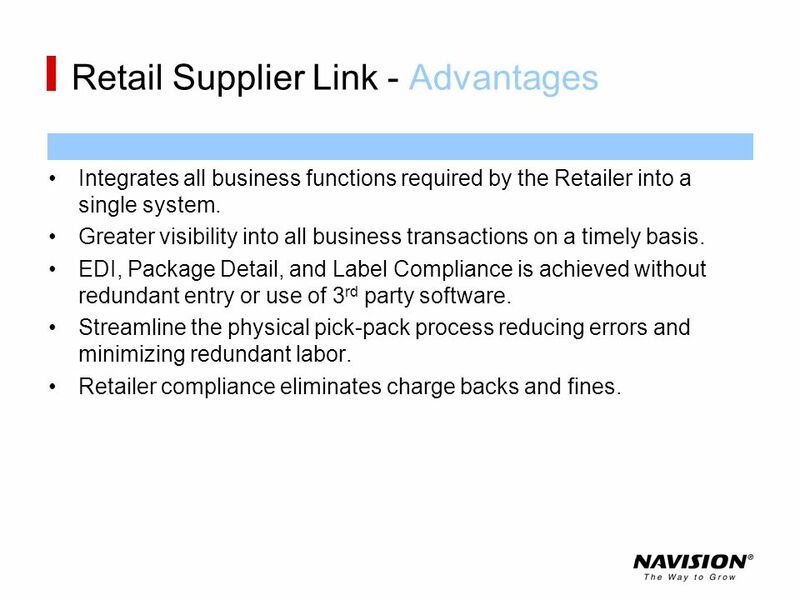 Retailer compliance eliminates charge backs and fines. Download ppt "specifically designed for Manufacturers and Distributors"
1/23/2014 Transportation Software At Its Best! Aljex Logistics. The Rest of EDI - International and Transportation/Logistics. 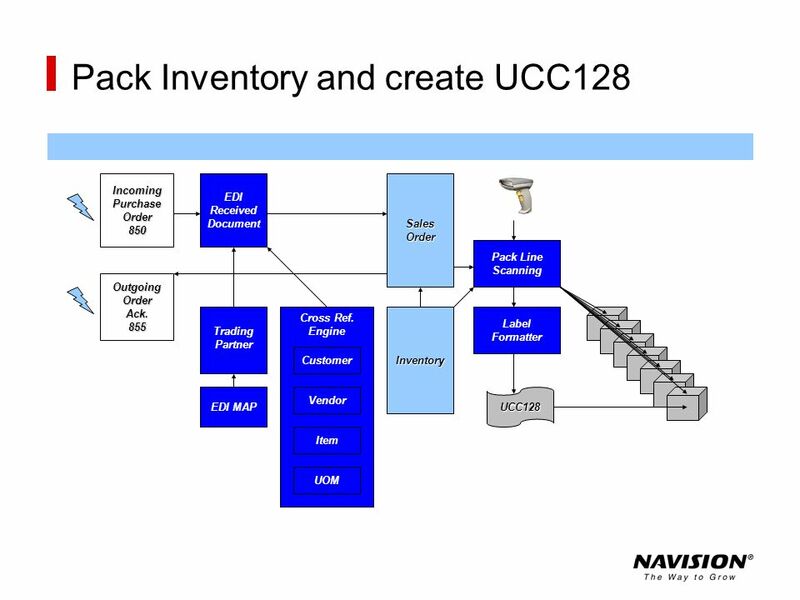 Click Mouse to advance presentation Warehouse Support System with UCC-128 Bar-coding Presented by: Shannon Systems LLC, the developers of B2BGateway. Cut Costs and Improve Order Efficiency with EDI September 16, 2009 Jim Augenstein Andrew Bing. 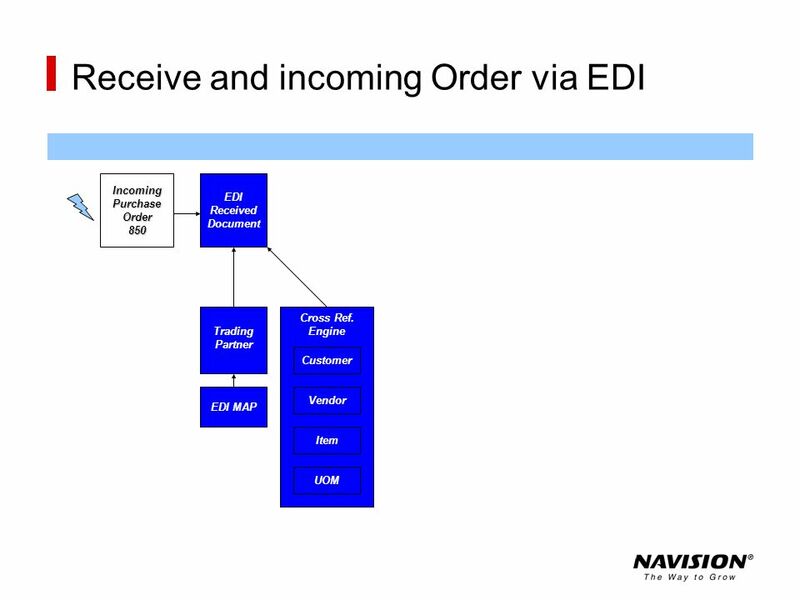 EDI Desktop Functionality. 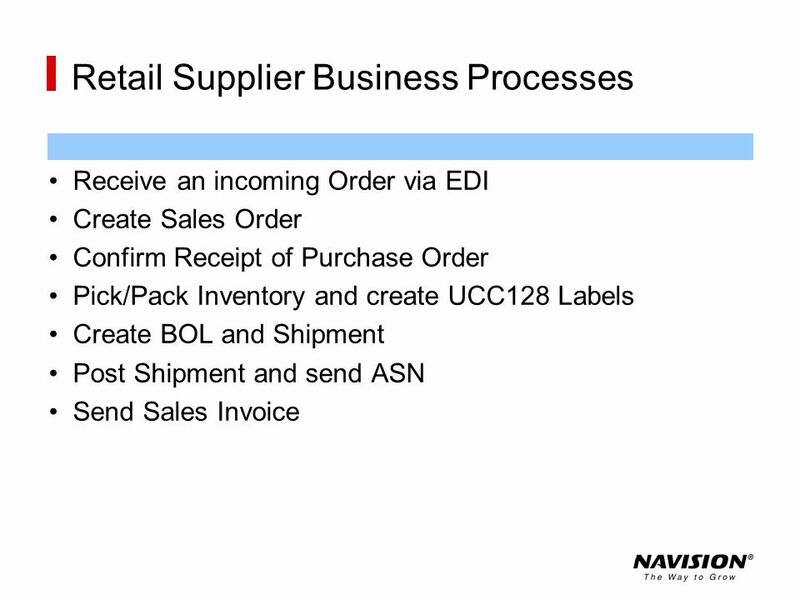 EDI Desktop is an environment for sites that must comply with retail or grocery industry EDI requirements. EDI Desktop can.  Presented By: Steve Cromer – Stein Industries Inc Mike Mina – Logan Consulting QAD Midwest Users Group EDI Case Study. DCMS Lite: WMS at an affordable price. 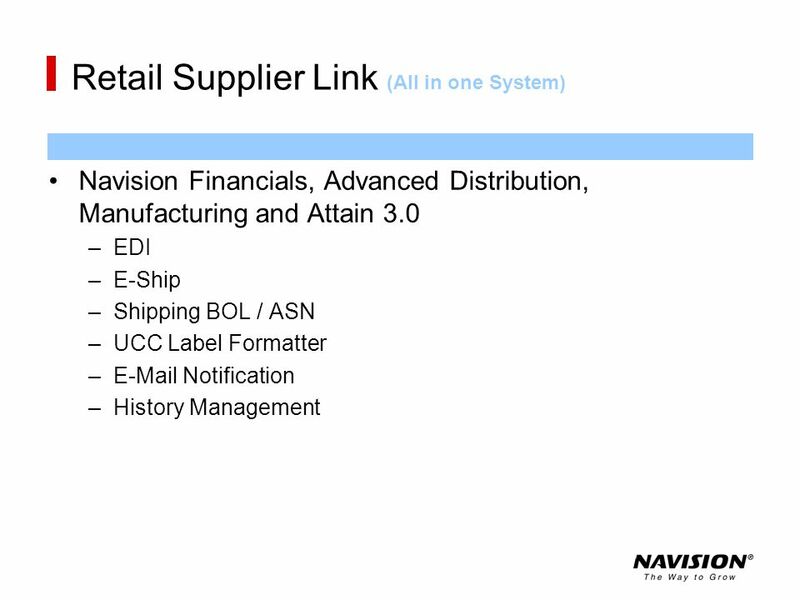 OVERVIEW DCMS LITE is tailor-made for small warehouses and 3PL providers. DCMS LITE allows you to meet customer. Inter-Warehouse Transfers An Enhancement For iSeries 400 DMAS from  Copyright I/O International, 2004, 2005, 2007, 2010 Skip Intro.